The face melter strikes again! If that doesn't make sense to you, let me go ahead a redirect you a previous Red Electric Rainbow Release here. 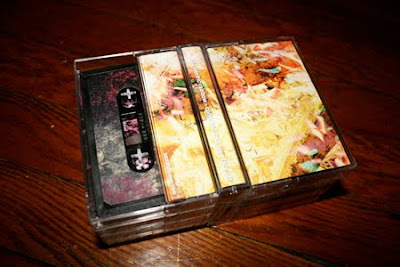 Another gem from Sacred Phrases, this tape is certainly a stand-out of 2011. While Red Electric Rainbow sticks to his usual arsenal of spacey vibes,strobe lights, and cracking open glowsticks to huff their innards--this release is markedly different in it's varied use of throbbing percussive lines. I could really get used to this new sound. There are 4 jams on this tape,clocking in at just under half an hour, and the repeated flipping is satisfying in a strange sort of way. Side A features a well-composed 2-song title track suite and the flip B-side is home to the 15-minute "Mayan Forest" which is so massively epic that I believe I used it as the closing song of my radio show for three consecutive weeks. I was on the Sacred Phrases website the other day, and I noticed that although it's been limited to a scant 100 copies, this tape was still in print! Which means that less than 100 people have heard this. Which is absurd.